The official language of the Conference is English with no translation. Abstracts (1 page, approx. 400-500 words) will be reviewed and published in the Conference Book of Abstracts in electronic form with ISBN and DOI number. All conference participants are eligible to compete for the Best Paper Awards. 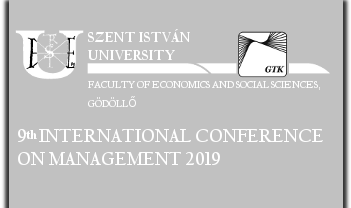 The Proceedings of the 9th International Conference on Management 2019 will be send for indexing in Web of Science Conference Proceedings Citation Index after the Conference. The Proceedings full papers must be 5-7 pages. The accommodation is not included in the registration fee. Participants should make room reservations individually, directly to the selected hostel/hotel. H-2100 Gödöllő, Páter K. utca 1.